On Waitangi Day (February 6th), we visited the Ngati Raukawa Marae in Otaki. Waitangi Day commemorates the signing of the Treaty of Waitangi in 1840. The Treaty is often referred to as the founding document of Aotearoa/New Zealand as a nation, and as such, is integral to New Zealand’s constitution.A central concept of the Treaty was the idea of “kaitiakitanga”, generally translated into English as “guardianship” or “stewardship” of the natural environment. Kaitiakitanga is underpinned by the responsibility of each generation to care for the natural environment so that it can be passed on to the guardianship of the next generation. Pictured is the front of the wharenui (meeting house). It is made up of three main elements representing the human body: the tekoteko (carved figure) on the roof top represents the head; the maihi (front barge boards), the arms, held out in welcome; and the amo – the upright boards, representing the legs. 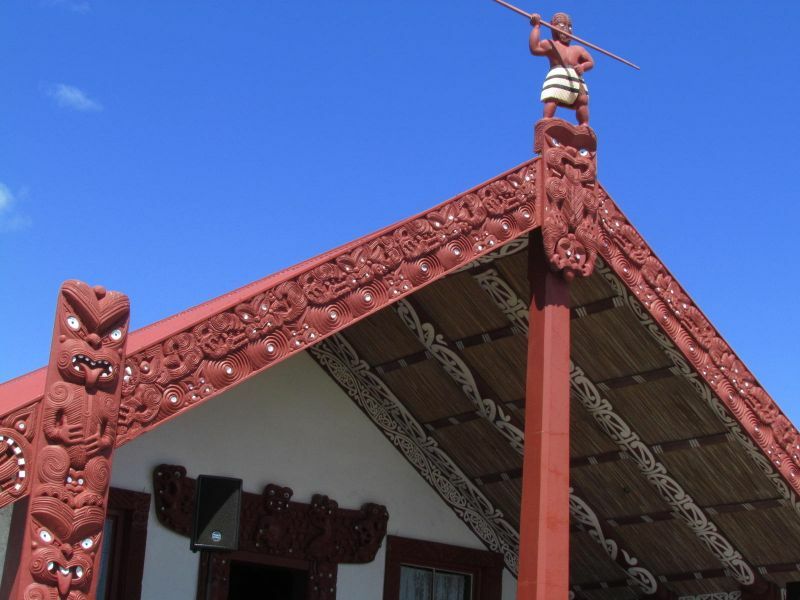 Many wharenui contain intricate carvings and panels that refer to the whakapapa (genealogy) of the tribe, and to stories and legends about people and the land. I despair that we are not of a mind to take Kaitiakitanga as important and essential to ensure continued life on this planet. Instead we are only able to think of jobs and perceived “balance” between environmental damage and profit and growth for business. An honest economy would measure long term cost to the environment as an essential to an honest calculation of economic growth and social welfare. Not a possibility for this government to consider. Kaitiakitanga means guardianship, preservation, conservation, fostering, protecting, sheltering -because of matauranga maori, and whakapapa to the whenua. By no means does it mean stewardship as defined in the RMA. Only the tangata whenua can be kaitiaki, the rest are conservationalists. At no disrespect, but because pakeha and others do not have the same belief system as Maori, the term kaitiakitanga is not held within their belief system. Being kaitiaki runs deep within who we are as maori, our history, belief system and culture.